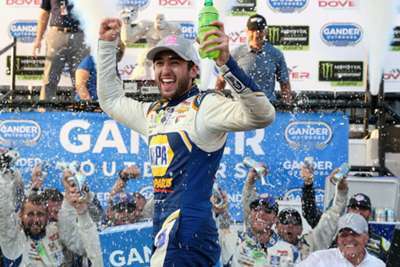 After many of NASCAR's playoff drivers piled up in a late accident, Chase Elliott emerged with an improbable win at Dover International Speedway. Elliott led at the overtime restart and held off Denny Hamlin — who was on much fresher tires — for victory on Sunday. Joey Logano finished third, followed by Erik Jones and Kurt Busch. It was Elliott's second career triumph, coming on the heels of his first win at Watkins Glen in August. More importantly, the victory earned Elliot a spot in the next round of the NASCAR playoffs. "We had a penalty there early, fell behind, but luckily had a good enough car and good strategy to come back," Elliott told NBCSN. Elliott was enjoying a solid if unspectacular afternoon up until the final laps, when a multi-car crash changed everything. Aric Almirola hit the wall on a restart with four laps remaining in an incident that also involved playoff drivers Brad Keselowski, Alex Bowman, Martin Truex Jr., and Ryan Blaney. They were not the only playoff drivers who had trouble at Dover. Clint Bowyer was running in the top 10 with less than 20 laps remaining when he had to pit for a loose wheel. He then slammed into the wall a few minutes later and ended up finishing 35th. Now, all those drivers, along with most of the rest of the playoff field, will have to sweat out next Sunday's race at Talladega Superspeedway, which always holds the potential for the "Big One" that can send anyone to a 39th-place finish in the blink of an eye. 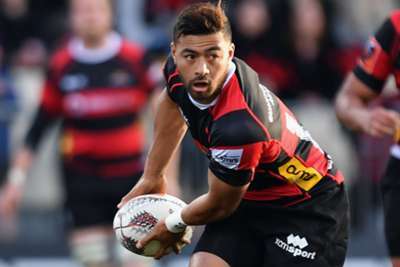 New Zealand have been handed a boost after Richie Mo'unga committed his future to the All Blacks.